During World War II thousands of American, Allied, and other prisoners of war were transported on ships to Japan or Japanese-held territory. Generally packed below decks into the ship holds like so much cargo, the prisoners endured such unspeakably vile conditions that many survivors recalled the voyage as the worst ordeal of their POW experience. In the ultimate irony of war, Allied forces bombed and torpedoed a number of these unmarked “hell ships,” unknowingly sending thousands of their countrymen to their deaths. POW casualty numbers vary in the records, but the grim details of horrifying ship conditions and death at sea remain painfully consistent. In Unjust Enrichment: How Japan’s Companies Built Postwar Fortunes Using American POWs, author Linda Goetz Holmes cites official Japanese records stating that “of 55,279 Allied POWs transported by sea, 10,853 drowned, including 3,632 Americans. At least 500 perished at sea from disease and thirst.” (Goetz, 33) Most of the POW transports were Japanese merchant ships built by and registered to Japanese corporations, including the familiar names of Mitsubishi and Kawasaki. Of sixty-nine merchant ships, twenty-one were torpedoed by the Allies. Goetz lists the ship owners and details of voyages in Appendices B through D of her book. While none of the Wake POWs perished as a direct result of conditions or attacks on the hell ships, twelve of their fellow civilian contractors died when the Arisan Maru was torpedoed in 1944. Contractors Pacific Naval Air Bases (CPNAB) employed hundreds of construction workers on a number of islands in the Pacific, all of which came under some form of Japanese attack in the early days and weeks of the war. Including Wake, three of these locations fell to the Japanese. Guam was swiftly seized on the second day of war and the Japanese took seventy CPNAB contractors prisoner (one died in the invasion) along with other civilians and military personnel. In the Philippines, the Japanese followed up their devastating attack on Clark Field by targeting the incomplete navy installations at Cavite where several of the thirty-seven American CPNAB employees died. Most of the remainder retreated with American and Filipino forces to the Bataan peninsula. 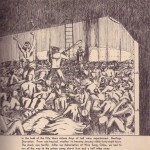 Following their defeat, the survivors were thrown into the squalid POW camps of the Philippines. By 1944 the Japanese were shipping thousands of POWs to camps in the home islands. One of these transports, the Arisan Maru, sailed from Manila for Japan in October 1944, its holds packed with nearly 1,800 prisoners, including twelve CPNAB civilian contractors. An American submarine torpedoed the unmarked ship in the South China Sea: only eight POWs survived. The Wake Island POWs, both military and civilian (except for the 98 contractors who remained on Wake and were killed in 1943 and four others who died on or near Wake in early 1942), were taken off Wake in three drafts in 1942. All three transports made it to their destination unscathed, though conditions in the holds were abysmal. In January 1942 the Nitta Maru carried the majority, over twelve hundred, to POW camps in occupied China and Japan. All but five of the prisoners survived the voyage: two marines and three sailors were selected for execution (beheaded, mutilated, and their bodies thrown overboard) to avenge Japanese losses in the taking of Wake. In May the second draft of twenty servicemen, too wounded to accompany the January group, left Wake on the Asama Maru for POW camp in Japan. The last Americans to leave Wake alive departed in September 1942 on the Tachibana Maru. In one of the final acts of war, the Tachibana Maru, by then converted to a Japanese army hospital ship and painted white with red crosses, was intercepted by the USS Charrette and Conner in the Banda Sea north of Timor. The son of a crew member of the Charrette happened upon my website last week and told me about his father’s participation in the dramatic capture of this ship and its surprising cargo in early August 1945. Further research reveals that when the search party boarded the Tachibana Maru, they found most “patients” in good health and mortar shells in boxes marked as hospital supplies. Ultimately some thirty tons of ammunition and hundreds of guns were uncovered and authorities took seven hundred prisoners, the largest single capture of Japanese troops in World War II. Deceptive or not, marked ships might have enabled thousands of Allied prisoners to avoid the terrible fate that befell them as human cargo on the torpedoed hell ships of World War II.